Chicago Black Oceanographers--here are three events in celebration of Michael Zapruder's Pink Thunder, a new collection of songs featuring collaborations from 23 poets. Pink Thunder is a truely sensory experience, and if you can make one of these event, you can experience it to the fullest. Rational Park is excited to host 22 portmanteaus, each containing a song from the album Pink Thunder—a collection of free-verse pop art-songs, including contributions from 23 poets, three engineers, and a few dozen musicians. What began as a bus tour that brought together hundreds of American poets has been recorded and remixed into a potent collection of poem-songs. Pink Thunder features instrumental contributions from over forty musicians and poems from Noelle Kocot, James Tate, Bob Hicok, Mary Ruefle, D.A. 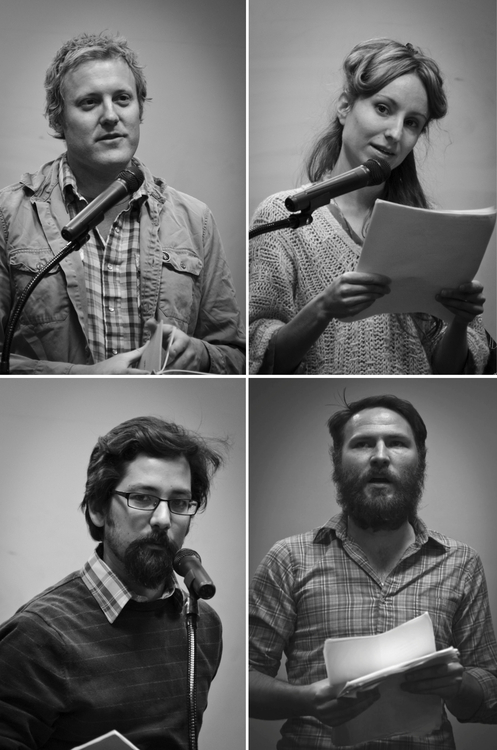 Powell, Dara Wier, Joshua Beckman, and Valzhyna Mort. The album was released on October 16, 2012 via The Kora Records. Friday, March 22 from 7-10, we invite you to view and listen to each portmanteau. These unique pieces, which combine sculpture and sound, are equipped with headphones for your listening pleasure. Tuesday, April 2 takes us offsite to presenting partners, Danny’s Reading Series. At Danny’s Tavern, 1951 W. Dickens Ave, 7:30pm sharp, Zapruder will be joined by Billy Blake and the Vagabonds members, Kennedy Greenrod and Reid Coker. Each will perform a few songs from their recent albums, and then answer questions about blending poetry and songwriting. Hosted by Joel Craig and Fred Sasaki. This event is being presented by Black Ocean, Danny’s Reading Series, Rational Park, and MAKE Literary Productions. Black Ocean authors Brandon Shimoda, Zachary Schomburg, and Joshua Marie Wilkinson, along with Dot Devota, kicked off their European tour yesterday, while many of us dreamt of it from afar. Thankfully, you can get a little bit closer no matter where you are because this amazing quartet will be live tweeting their experience from the Black Ocean Twitter account using the hashtag #océannoir. Follow along, ask questions, and interact. For our European friends (or worldwide travelers), catch Black Ocean authors Brandon Shimoda (The Girl Without Arms), Zachary Schomburg (The Man Suit, Scary No Scary, Fjords vol. 1), and Joshua Marie Wilkinson (Swamp Isthmus) on tour across Europe for the next couple of weeks! 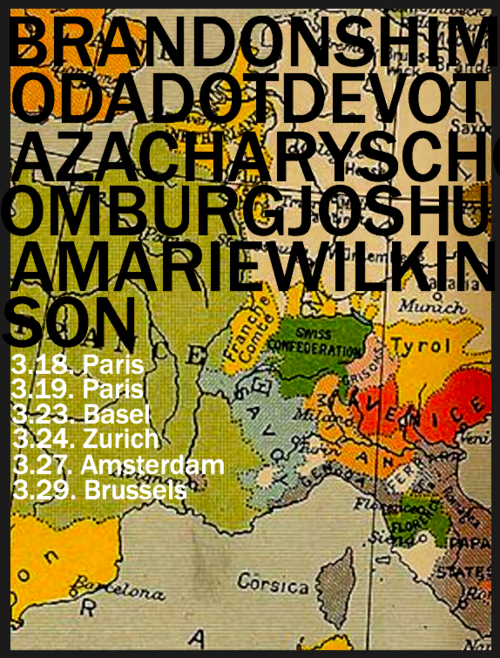 3/29, Brussels, Belgium—International School of Brussels—with Dot Devota, Zachary Schomburg & Joshua Marie Wilkinson. Don't miss Joe Hall touring for his latest book from Black Ocean, The Devotional Poems, now available for pre-order. View the dates above, and save the date when it hits your town! With your lightning powered aggregators, your nanomembranophones, your hydrolytic isomer skin-suit apparatus, it will require an imaginative leap wider than the great San Andreas Canyon that separates The People’s Republic of California from the once great nation of the “United” States to conceive of the cultural landscape in which Michael Zapruder’s Pink Thunder, which I recommend you ingest via light pulse array, was created. Rauan Klassnik’s new book, The Moon’s Jaw, follows in the black trough of his first, appending the space there with something perhaps even more strangely pregnant. It’s full of knives and silk and peacocks and breast milk and ghosts and fetuses and orchards and wounds and girls and suns. It shifts continually between horny and cruel tones, meditative and exacting tones, stiff and puffy images, swallowed up somewhere in the space between all bodies, where nature mutates and crushes you and grinds against itself forever. And in the realms of the real, the BASH reading series continues with its 8th installment on February 8 with Darcie Dennigan, Evan Glasson, and Christie Ann Reynolds in Brookline, MA. More info HERE. Black Ocean's own Zachary Schomburg will spend the weekend in Boise, ID, home of our managing editor Ms. A. Minetta Gould. 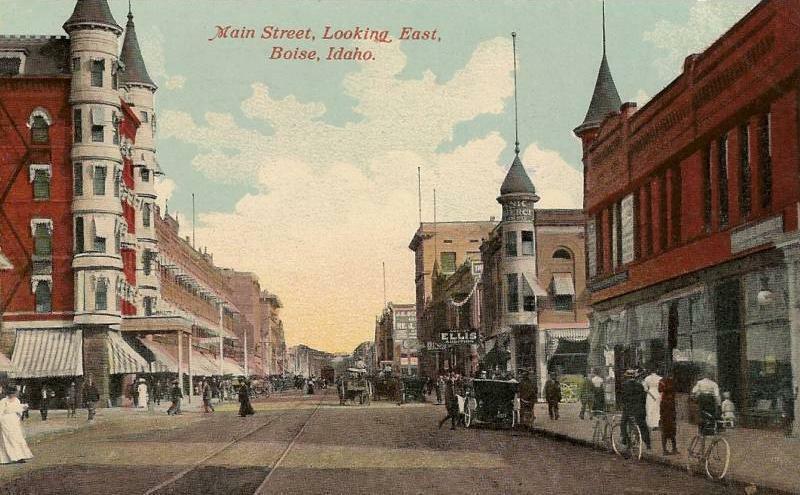 While in Boise Schomburg will conduct two writing workshops, visit Idaho's natural wonders, read alongside local poetry band The True Wheel (a duo consisting and the poet Karena Youtz & her husband Doug Martsch), read with poem films created by local artist John Shinn, and sleep in a swanky hotel. The first reading is at 6PM on Saturday, May 5 and the second is at 8PM on Sunday, May 6. Both readings will take place at The Crux Coffee House and are free and open to the public. We will post videos from each reading on our youtube page when they become available.